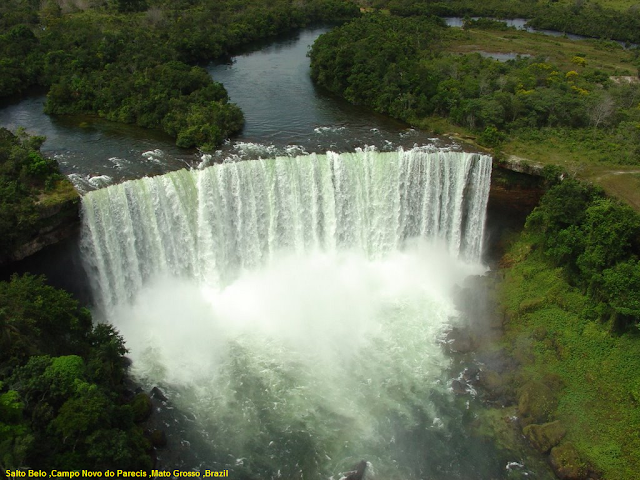 Salto Belo is a waterfall located in the municipality of Campo Novo do Parecis , in the state of Mato Grosso , Brazil . It has 45 meters of fall, forming a voluminous curtain of water. It is located in an indigenous reservation 74 km from the center of the city of Campo Novo do Parecis . Its waters come from the Sacre River . In 2009, sportsman Pedro Oliva descended the waterfall in a kayak, winning the then world record of "extreme kayak", which was surpassed in 2010. Located in indigenous land, near the villages Sacre II and Bacaiuval, in a place of great scenic beauty and preserved vegetation, the jump is situated 74 km from the urban nucleus and is formed by the clear waters of the river Sacre, which plummets in freefall of a height of 45 meters gives me strong rapids. The place is a natural divider between Campo Novo do Parecis and Brasnorte, having favorable conditions for the practice of adventure sports, such as rappel.